The SESRIC was represented thereat by Dr. Savaş Alpay, Director General; Dr. Kabir Hassan, Advisor to the Director General; Mr. Nabil Dabour, Director of Economic and Social Research Department; Mr. Mehmet Fatih Serenli, Director of Training and Technical Cooperation Department; Mr. Esat Bakimli, Researcher; and Mr. Haytham Zeinelabdin, Researcher. The Meeting of the Senior Officials of the 25th Session of the COMCEC was held on 5-6 November under the Chairmanship of H.E. Kemal Madenoğlu, Undersecretary of the State Planning Organization of the Republic of Turkey. During the Meeting, the delegations of the Member States and the OIC institutions considered and deliberated on a number of agenda items related to various issues of enhancing economic and commercial cooperation among the Member States. World economic developments in conjunction with the OIC member countries: implications of the financial crisis, fluctuating commodity prices and developments in global energy markets on the economies of the member countries. Review of the implementation of the OIC Ten-Year Programme of Action and the Plan of Action to Strengthen Economic and Commercial Cooperation among the OIC Member States. The outcome of the study by COMCEC and SESRIC to enrich the agenda and substance of the COMCEC. The Trade Preferential System among the OIC Member States (TPS-OIC). Recent developments of intra-OIC trade and other related issues. Financial cooperation among the OIC member countries and enhancing intra-OIC investment flows: cooperation among Stock Exchanges and Central Banks of the OIC member countries. Development of OIC Halal food standards and procedures. E-government applications and their economic impact on the OIC member countries. Review of the implementation of the Islamic Solidarity Fund for Development (ISFD). Review of the implementation of the Action Plan for OIC Cotton Producing Countries, Cooperation Development Strategy (2007-2011). Vocational Education and Training Programme for OIC Member Countries (OIC-VET). Exchange of views on the “Impact of Food Crisis on the Economies of OIC Countries”. Other business: the Statistical Working Group (SWG) at the OIC level and cooperation among the Development and Cooperation Institutions (DCIs) of the OIC Member States. The SESRIC contributed the following background reports and studies dealing with some prominent agenda items of the Meeting: (1) Annual Economic Report on the OIC Countries 2009; (2) Enhancing Economic and Commercial Cooperation among OIC Member Countries; (3) E-government Readiness: The Performance of the OIC Member Countries ; and (4) Results of the Questionnaire Circulated by the SESRIC to the Member Countries on the Proposed Themes for the COMCEC Exchange of Views Sessions. In addition to the presentations made by the Centre on these reports, the Centre also made presentations and briefed the Committee on the following agenda items: (1) Cooperation among the Central Banks of the OIC member countries; (2) Vocational Education and Training Programme for OIC Member Countries (OIC-VET); (3) The Statistical Working Group (SWG) at the OIC level; and (4) Cooperation among the Development and Cooperation Institutions (DCIs) of the OIC Member States. In their deliberations on all these issues, the Senior Officials discussed and considered the recommendations and policy implications of many technical and background reports prepared and presented by various relevant OIC institutions as well as those of some related international and regional organizations. They also prepared the Draft Resolutions on these issues for consideration by the Ministerial Meeting, which was held on 7 November 2009. 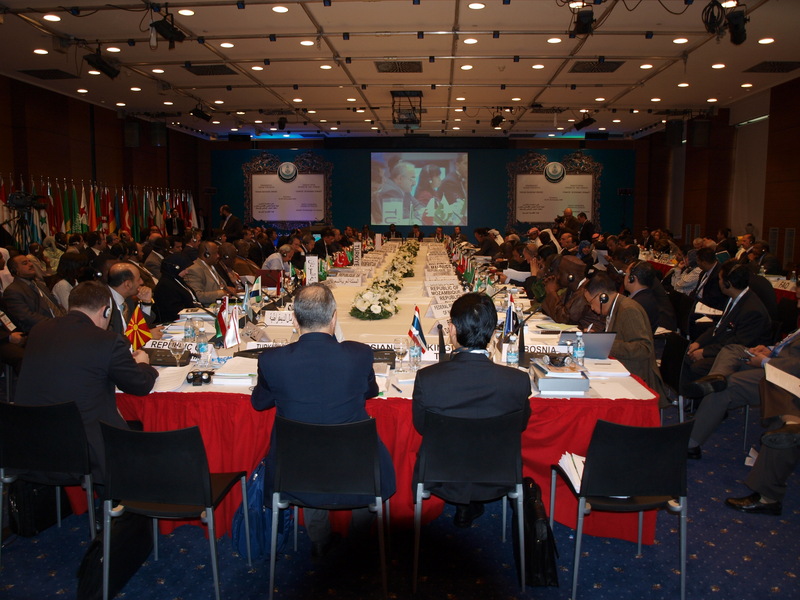 The Ministerial Meeting of the 25th Session of the COMCEC was held on 7 November 2009. The Opening Ceremony of the Meeting was held under the chairmanship of H.E. Abdullah GÜL, President of the Republic of Turkey and the Chairman of the COMCEC. In his inaugural address, H.E. Abdullah GÜL, referred to the past activities of COMCEC and stressed that the current era offered a suitable environment for reflecting the experience and wisdom as well as the peaceful character of the Islamic civilization to the world. He said that we should take the opportunity of the special occasion of the 25th Anniversary to make the best of COMCEC as a platform which has proved its success over the past 25 years. He mentioned that we should aim at rendering COMCEC more effective and strong in the period ahead, by strengthening its corporate structure and drafting a viable vision document. He added that it is also crucial for member countries to demonstrate a stronger political will and employ a more effective bureaucratic follow-up. While touching on the recent finance, energy and food crisis, H.E. GÜL stated that in the process of restructuring the world economy, new approaches serving the welfare of all mankind are needed and OIC Countries ought to have a greater role in that process. He also underlined the importance of resolving regional problems by countries located in their own region and thus their solutions are to be worked out by themselves in order to reach permanent peace in the region and in the world. In this context, H.E. GÜL highlighted the efforts of Turkey to achieve this target in the Middle East region, including the Israeli-Palestinian conflict, Iraq and Afghanistan. H.E. GÜL stressed the need to help those countries in the period of establishing peace and reconstruction while combating terrorism and concentrating on education against the ideologies of the militant elements. H.E. Abdullah GÜL concluded his speech by emphasizing that Turkey will continue to extend its support to all cooperation efforts within the framework of COMCEC and carry our common problems to other global platforms. His Excellency Prof. Dr. Ekmeleddin İHSANOĞLU, Secretary General of the OIC, made a statement at the Opening Session, in which he stated that the 25th Anniversary of the COMCEC was marked as a milestone in the efforts of the OIC for diversifying the mandate of the Organization and creating mechanisms to promote the economic welfare and development of the Muslim world. Highlighting its past activities and future perspectives, Prof. İHSANOĞLU underlined the “Framework Agreement on Trade Preferential System”, which had entered into force in Autumn 2002, as one of the most important achievements of COMCEC at the beginning of the third Millennium. In conclusion, H.E. Prof. Ekmeleddin İHSANOĞLU stated that as the world is reshaping itself into larger economic communities based on common interests and shared values, the OIC could achieve greater success by commitment of its Member States to taking bold steps in the right direction to reach realistic goals. The Heads of Delegation of the State of Kuwait, Republic of Senegal and the Islamic Republic of Iran made statements on behalf of the Arab, African, and Asian groups of Member States, respectively. They expressed their thanks to the Republic of Turkey for the hospitality extended to the delegates and H.E. Abdullah GÜL for his wise leadership in guiding economic and commercial cooperation among the OIC Member States. They stressed the need of enhancement the problem-solving capacity and increasing competitiveness and productivity within the OIC region. They also thanked OIC Secretary General H.E. Prof. Ekmeleddin İHSANOĞLU, OIC General Secretariat, COMCEC Coordination Office and relevant OIC institutions for their efforts to strengthen economic and commercial cooperation among the Member Countries. H.E. Dr. Ahmed Mohammed ALI, the President of the Islamic Development Bank (IDB), delivered a statement at the Opening Session, in which he underlined the importance of the COMCEC for the OIC Countries and gave information on the good relationship between COMCEC and IDB which had developed during the past 25 years. Dr. Alwi SHIHAB, Secretary General of the Islamic Chamber of Commerce and Industry (ICCI) read out the message of H.E. Shaikh Saleh Bin Abdullah KAMEL, the President of the ICCI. In his message, H.E. Shaikh KAMEL underlined the achievements of the ICCI in the last year and touched upon a number of issues related to the future activities. An award ceremony was held at the end of the Opening Session, where H.E. Abdullah GÜL presented plates of gratitude to H.E. Prof. Ekmeleddin İHSANOĞLU, Secretary General of the OIC; H.E. Dr. Ahmed Mohammed ALI, President of the IDB; Dr. Alwi SHIHAB, Secretary General of ICCI on behalf of the President of ICCI; Dr. Savaş ALPAY, Director-General of SESRIC; Mr. Allal RACHDI, Director-General of ICDT; Mr. Imtiaz HOSSAIN, Rector of IUT; Dr. Abdullatif Bin Abdullah BIN SULTAN, Secretary General of OISA; and to Dr. Halid EREN, Director-General of IRCICA, for their invaluable contribution to the COMCEC activities. The “Islamic Solidarity Prize for the Enhancement of Trade among OIC Member Countries” was accorded to the İGEME (Export Promotion Centre of Turkey). Finally, Mr. İbrahim ŞAHİN, Director-General of Turkish-Radio Television Corporation, extended H.E. Ekmeleddin İHSANOĞLU a documentary film of OIC prepared for the occasion of the 40th Anniversary of OIC. The Ministerial Working Session was held afternoon under the Chairmanship of H.E. Dr. Cevdet YILMAZ, Minister of State of the Republic of Turkey. Following the adoption of the Agenda, Dr. Savaş ALPAY, Director-General of SESRIC, made a presentation on the study “Enriching Economic and Commercial Cooperation among OIC Member Countries”, which was prepared by SESRIC and COMCEC Coordination Office. 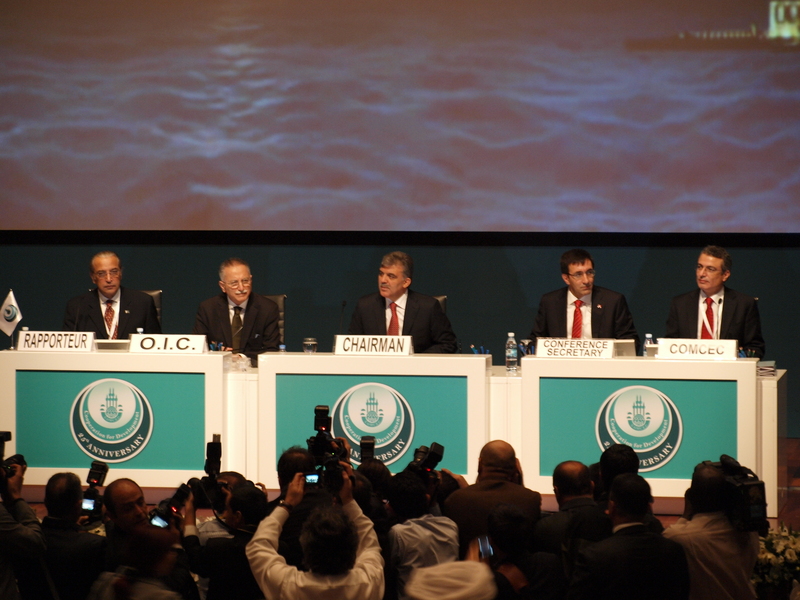 The Ministers exchanged their views on the theme “Impact of Food Crisis on the Economies of OIC Member Countries”. In its capacity as the Chairman of the Senior Officials Meeting, H.E. Kemal MADENOĞLU, Undersecretary of the State Planning Organization of the Republic of Turkey, summarized the discussion made by the Senior Officials on the said theme. H.E. Hafez GHANEM, Assistant Director-General of UN Food and Agriculture Organization (FAO), made a presentation on related issues such as hunger, effects of financial crisis, investment in agriculture and agricultural growth and evaluated the negative impacts of unstable and fluctuating food prices on rural and urban poor in developing countries. The Heads of Delegations of Turkey, Morocco, Qatar, Palestine, Kyrgyzistan, Kazakhistan, Sudan, Somali and Gambia shared their country experiences as well as brought up cooperation proposals in the area of food security. On the theme “Crisis in the World Financial Markets and Implications on the OIC Member Countries”, Dr. Mohsin S. KHAN, Chief Economist in Peterson Institute and Former Director-General of IMF in charge of Middle East and Mid-Asia, delivered a keynote speech. Prof. Hassan KABIR, University of New Orleans and Advisor to the Director General of SESRIC, made a presentation on Islamic Finance and its potential role in avoiding financial crises. Dr. Savaş ALPAY, Director-General of SESRIC, also made a statement summarizing the Report and recommendations of the Meeting of Governors of Central Banks of OIC Member Countries, which was organised by SESRIC and the Central Bank of the Republic of Turkey in Istanbul on 3 October 2009. On the same theme, Mr. Erdem BAŞÇI, Deputy Governor of the Central Bank of Turkey, made a statement on G-20 platform which includes three member states of the OIC namely Indonesia, Saudi Arabia and Turkey. In his statement, Mr. BAŞÇI said that the global financial crisis of 2008 had made it clear that with their limited representation, forums such as G-7/G-8 were no longer adequate as global steering groups. He highlighted that being member of G-20, Turkey had a prominent role in bringing to light the emerging market perspective in G-20 in the process of designing of a new global financial system. Mr. Rıfat HİSARCIKLIOĞLU, Chairman of the Union of The Chambers and Commodity Exchange of Turkey and Mr. Ömer Cihat VARDAN, Chairman of the MÜSIAD delivered their respective statements on the outcome of the OIC/COMCEC Business Forum held on 05-06 November 2009 concurrently with the 25th Session of COMCEC with the participation of more than 200 businessmen from the Member Countries. They underlined the need for the member countries to open up their economies to economic and commercial activities of businessmen and merchants. A special signing ceremony was held at the Ministerial Session, where the Head of Delegation of the State of Qatar signed the TPS-OIC Rules of Origin; the Head of Delegation of Cote d’Ivoire signed the “General Agreement on Economic, Technical and Commercial Cooperation”, “Agreement on Protection and Guarantee Investment” and “Framework Agreement on TPS-OIC”. Furthermore, the International Islamic Trade Finance Corporation (ITFC) signed respective Special Line Agreements with the Turkish Export Credit Bank (Eximbank) and four Iranian Banks, namely Bank Melli Iran, Bank of Industry and Mines, Parsian Bank and Karafarin Bank each. On the theme “Developments in the Global Energy Markets and their Implications on the OIC Member Countries”, Dr. Zafar IQBAL, Chief Economist at the IDB, delivered a keynote speech focusing on the fluctuation of energy prices due to rising cost of raw materials in the OIC countries. Mr. IQBAL stressed the need for global crisis-management approaches and also emphasized close cooperation among particular OIC countries which are net energy materials-exporting countries like fuel and natural gas. The Ministerial Working Session then adopted the Resolutions drafted by the Senior Officials Meeting held on 5-6 November 2009. At the end of the Ministerial Meeting of the 25th Session of the COMCEC, H.E. Dr. Cevdet YILMAZ, Minister of State of Turkey, delivered a closing statement. He stated that the global economy had gone through profound changes over the past two years and that food and energy crises, followed by the global financial crisis had inevitably affected the economies and peoples of the OIC Member States. H.E. Dr. YILMAZ expressed his satisfaction with the COMCEC initiatives such as Central Banks Meeting of OIC Countries, which they hope would bring more cooperation in tackling the negative effects of the crises. He also underlined some promising cooperation agenda items of COMCEC, including OIC Stock Exchanges Forum, cooperation among the Capital Markets Regulatory Bodies of Member Countries, poverty alleviation and Islamic Solidarity Fund for Development, implementation of Cotton Plan of Action, and Food Security road map. On the occasion of the 25th Anniversary of COMCEC, an Economic Summit was held in Istanbul on 9 November 2009 under the chairmanship of H.E. Abdullah GÜL, President of the Republic of Turkey and Chairman of the COMCEC. The Summit was attended by the representatives of 41 OIC member countries. Bosnia-Herzegovina, the Russian Federation and the Turkish Republic of Northern Cyprus also participated in the Summit as observers. The OIC General Secretariat and the following subsidiary organs, specialized and affiliated OIC institutions attended the Summit: IDB, SESRIC, ICDT, ICCI, OISA and IRCICA. H.E. Abdullah GÜL inaugurated the COMCEC Economic Summit by delivering a statement, in which he stated that the purpose of COMCEC was to promote economic and commercial cooperation among member countries, rally around solidarity and develop the necessary infrastructure needed in this regard. He also noted that in order to promote future cooperation, the institutional structure of COMCEC ought to be strengthened, financing opportunities searched, viable projects with renewable vision developed, and strong political will exercised. H.E. 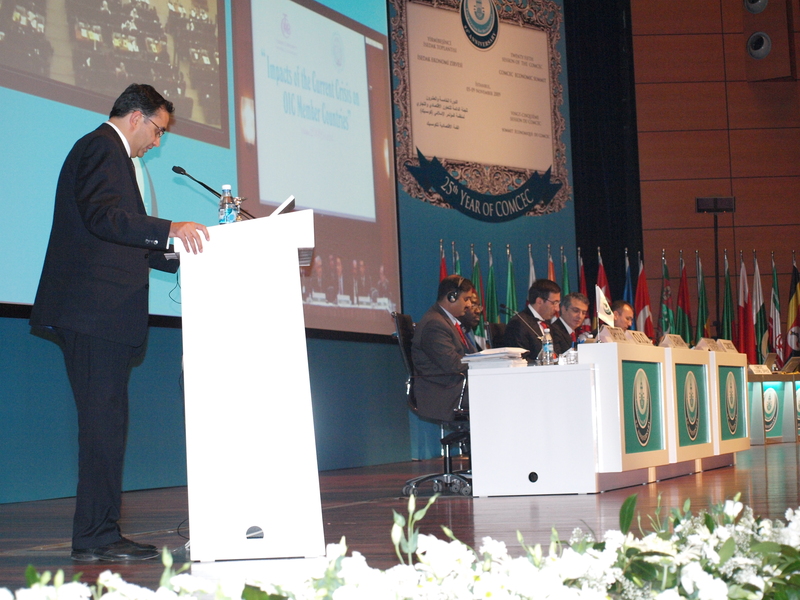 GÜL underlined that by availing itself of the capabilities bestowed on it, thanks to its strategic position, historical heritage, geographical and cultural ties, and experiences accumulated during the peace keeping missions, Turkey made efforts to contribute positively to the resolution of problems which, directly or indirectly, affect OIC member countries. In this respect, H.E. GÜL drew attention to the fact that this understanding of Turkey applied not only to the Palestinian issue, the Arab-Israeli conflict and the situation in Iraq and Lebanon within the context of the Middle East, but also to all other problems, which deeply affect Pakistan, Afghanistan, Sudan, Somalia and brotherly countries. H.E. Abdullah GÜL emphasized that Turkey would continue to extend its support to all cooperation efforts within the framework of COMCEC, and willing to organize the OIC Heads of State and Government Summit in 2014. His Excellency Prof. Dr. Ekmeleddin İhsanoğlu, Secretary General of the OIC, also made a statement, in which he expressed his thanks to the Government of the Republic of Turkey for its firm commitment to develop economic and commercial cooperation among the OIC Member States. H.E. İhsanoğlu paid homage to the copious support of Heads of State and Government through their countries’ identification with the numerous economic activities of the OIC. He concluded his remarks by saluting all officials in the General Secretariat and the COMCEC Coordination Office for their untiring efforts in preparing the Summit, and commending the tangible support received from all the OIC agencies in the particular areas of developing high-quality projects, which have greater potentials for active economic cooperation among OIC countries. Dr. Savaş ALPAY, Director General of SESRIC, made a presentation on the OIC Vocational Education and Training Program (OIC-VET) developed by SESRIC. The Program was then officially launched by H.E. Abdullah GÜL, President of the Republic of Turkey and Chairman of COMCEC. Following the statements of the Heads of Delegations, the Summit adopted the Istanbul Declaration. The Summit concluded with the closing speech of H.E. Abdullah GÜL, President of the Republic of Turkey and Chairman of COMCEC. In his closing speech, H.E. GÜL expressed his hope that the Istanbul Declaration would contribute to further improvement of economic and commercial cooperation among OIC member countries, in order to meet the challenges of the 21st century towards sustainable development and would be beneficial for all. He concluded his speech by expressing his deep gratitude to all the member countries for their support to COMCEC, the Heads of State and their representatives who attended the Summit, and all those who have worked meticulously for the organization of the COMCEC Economic Summit.